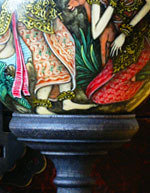 Meticulously hand painted over six months by a single master artist in Bali, these hollow ostrich eggs depict a ritual courtship dance in stunning detail. 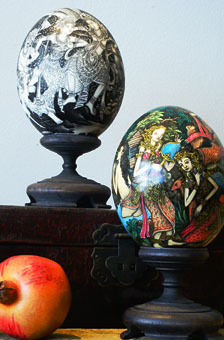 The eggs, painted using vegetable based dyes to preserve the integrity of the shells, rest on hand carved teak stands. 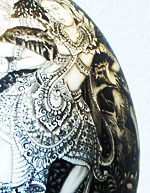 Symbolizing longevity and prosperity, the pair would make a perfect wedding gift for the discerning couple for whom a toaster just won't do. 4.5" w x 9.5" h (with stand) Imported.